Gochujang! If you’ve never heard of it before, it’s a Korean chili paste made from fermented soybeans, red chilis and glutinous rice. It’s been popping up more frequently in Food Network shows and sprinkled throughout issues of Bon Appétit lately, so I headed down to the Super 88 Market in Malden to pick up some for myself. When I got home and peeled back the cover, it revealed a thick and deeply crimson red paste. The first taste revealed a richly complex flavor with a dominant tone of umami, a nice heat level, a tiny bit of sweetness and a touch of saltiness. Although it’s traditionally used to make Korean Bibimbap and Bulgogi, I decided to use it in a sauce to spoon over piping hot baked sweet potatoes as a first try. Drizzle 1 TB of the peanut oil onto the bottom of a 12-inch cast iron pan and tilt to coat. 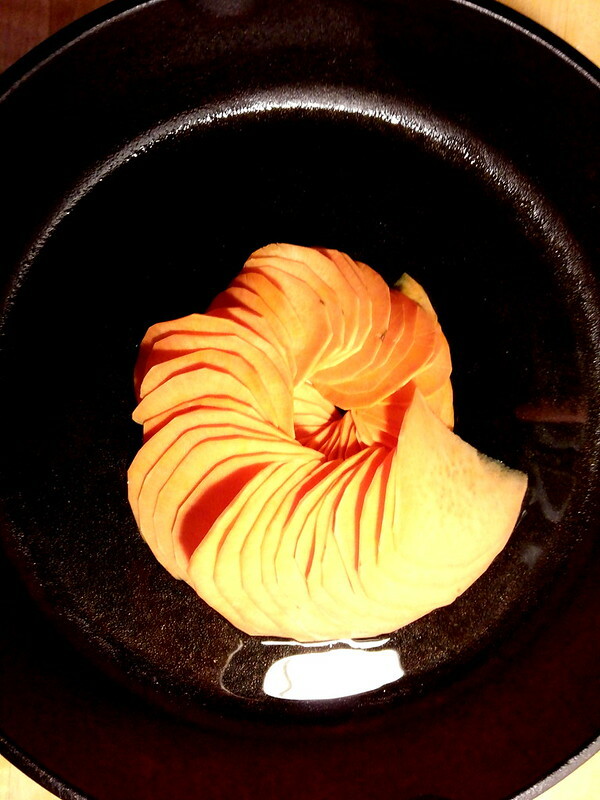 Peel then slice the potato on a mandoline slicer*. 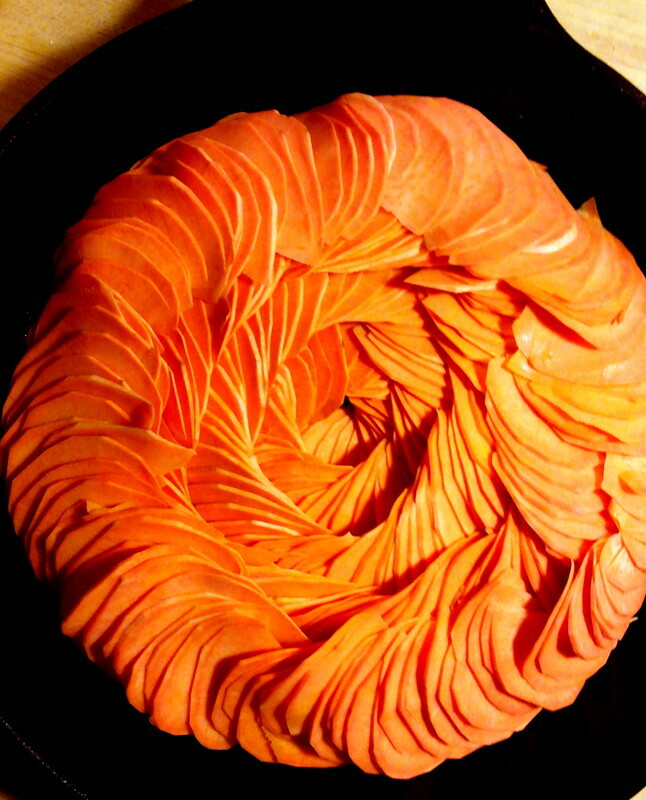 Arrange the slices in a spiral pattern, starting in the center of the pan, and then building it outwards towards the edges. Drizzle the remaining 1 TB of peanut oil over the top, then cover with tin foil and place into the oven to bake for about 35 minutes. While your potatoes are baking, make your sauce. 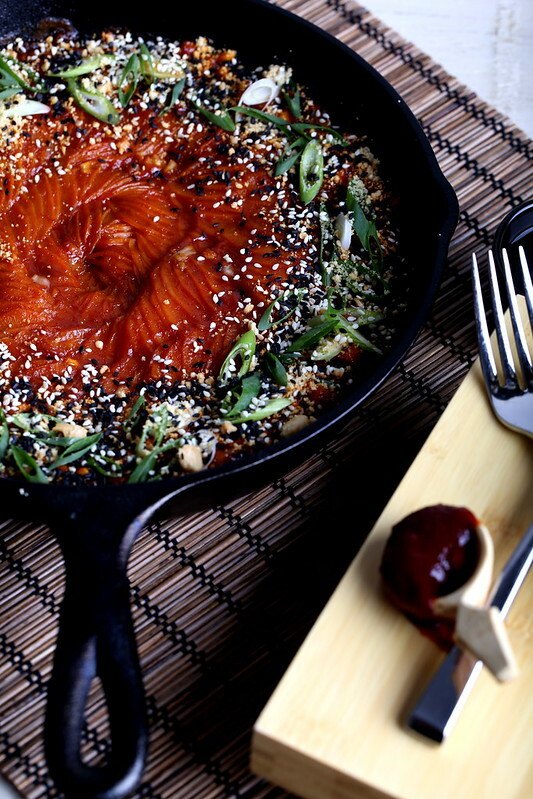 Warm the toasted sesame oil in a small saucepan over medium-low heat. Add in the chopped shallots and saute until softened, about 5 minutes. Remove from the heat, add in the rest of the sauce ingredients and stir until smooth. Set aside. Once your potatoes are done, remove the tin foil, then spoon about 3/4 of the mixture around the ring of the cast iron pan, then drizzle some of the liquid in the sauce over the center portion. Bake, uncovered, for 15 to 20 minutes more. Sprinkle the edges with the peanuts, scallions and sesame seeds, and serve with some of the extra sauce on the side. Allow to cool for about 10 minutes before serving. * You can also boil or bake chunks of sweet potato and serve mashed with the sauce if you don’t have the time or feel like slicing and spiraling the potato. Haha wasn't expecting the Ratatouille/Thomas Keller inspiration on the layout, looks amazing! Gochuchang and Gochugaru flakes both big experiment-y ingredients for me lately as well. Thanks! Gochujang flakes sound intriguing! 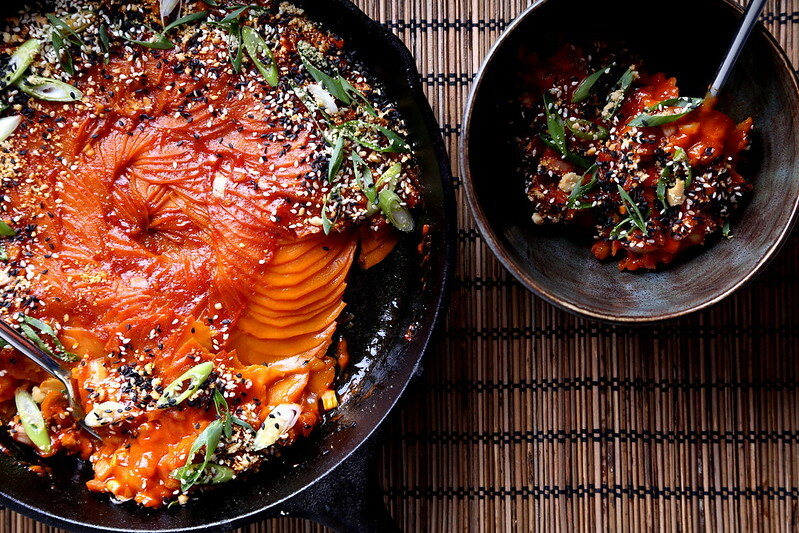 Check out the Kimchi Cookbook by Lauren Chun if you haven't already. The flakes are the ones used to make Kimchi, really dark red, not as spicy as most Asian chili flakes with a really deep flavor. The daikon kimchi recipe in particular in Lauren's book is amazing/vegan (or easily adapted) and I feel like you could probably do something amazing w it, it's super photogenic. Keep up the good work. Thank you so much, Andy — I will check that out! It is a bit spicy, but gochujang is nice because they sell different kinds with varying levels of heat intensity. this looks beautiful AND delicious! you are an artist, lady! I can't express how much I LOVE the idea of this–I rarely stumble across anything that looks so absolutely appealing, but this one did it for me, and I have a huge sweet potato along with my gochujan sitting in the fridge. Pinned, and most definitely lined up for dinner this week. Thank you for sharing this! Update–made and loved! The subtle taste of the peanut butter infuses so nicely into these slightly sweet, slightly tangy but wonderful soft sweet potatoes. I added extra black sesame seeds and they really did give it that great contrast of smokiness and texture. So glad I tried it, thank you! I am so happy you made this and liked it — thanks so much for your kind feedback, Ala! Did you puree the sauce? You didn't mention that in the recipe, so I didn't. I still loved it, but I would have loved it more not so chunky. Johanna, thanks for trying it out and letting me know! I did not puree the shallots/sauce, I kind of liked the contrast of the soft sweet potato with it, but pureeing of course would work too! Oh, I made this along with the Sesame-Miso Maitakes last night for dinner. I'm a Korean and I think gochujang is the best stuff ever!! lol haha. Thanks for sharing the recipe! 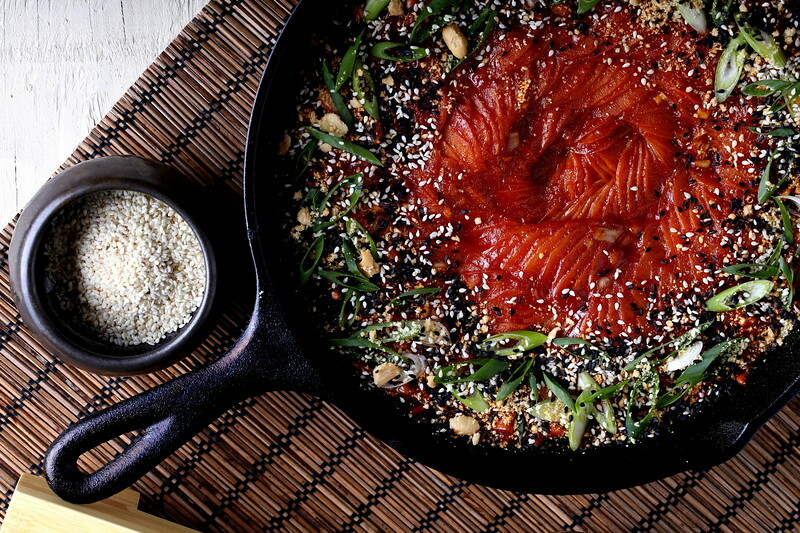 I can't believe that I've only just discovered gochujang — it's incredible! Oh, I love how creative this dish looks! I really appreciate other sweet potato lovers and the creative things we do with them. Yum! This looks amazing but apparently gluten free gochujang doesn't exist 🙁 any ideas for substitutes? Maybe a mix of miso and sriracha? Going to make this–it looks fantastic! I hope you like, Daphne! 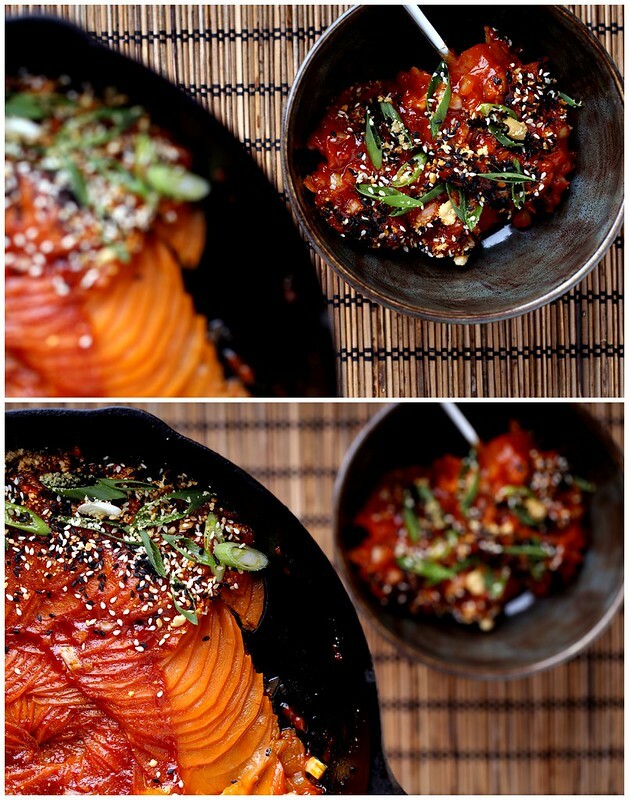 I can't believe I've only just tried gochujang recently — I can't get enough of it now!